Ever wish there were an easier way to add a website to the Favorites panel in Safari for iOS? Or what about getting the desktop version of a site rather than just the mobile version? If you’ve got iOS 8 installed on your iPhone or iPad, you’re in luck. Update 10/30/15: In iOS 9, the latest iOS update for iPhone and iPad, both the “Add to Favorites” and “Request Desktop Site” buttons have become options under the “Action” button (the square button with the upward arrow at the bottom of the screen). I was fiddling around with the new Safari the other day when I stumbled across a pair of handy new buttons, hidden just above the Favorites page—you know, the panel of “favorite” sites that appears when you tap the address bar. 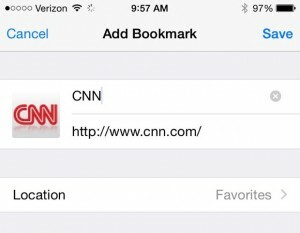 Tap Add to Favorites if you want to add the page you’re currently viewing to your Favorites in Safari. Pull down on the Favorites panel, and you’ll reveal the two hidden buttons: Add to Favorites and Request Desktop Site. Tap Request Desktop Version, and Safari will go out and “fetch” the full desktop version of a web page, perfect for anyone who’d rather skip the bare-bones mobile “skin” for a given site. Want to edit the Favorites screen in Safari? Just tap the address bar to get to your Favorites, then tap and hold an icon. You can then rearrange the icon by dragging it around, or release it to reveal a pop-up with “Delete” and “Edit” buttons. Got questions about iOS 8? Let me know!